As we all know flying between Indonesia’s islands can add up and become expensive. Garuda Airlines, now back to flying from Heathrow to Jakarta direct, are offering a new “Adventure Pass” with special fares destinations such as Labuan Bajo, to see the Komodo dragons, Banyuwangi, home of the most colourful festivals, and Lombok for volcanoes and beaches. 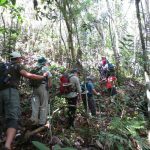 We at Borneo Travel have itineraries for individuals and groups who want to combine Indonesia’s wildlife with some beach time.